Former Gov. Rick Perry's money woes have caused his campaign to cease paying all its staff. The news started late Monday afternoon when National Journal reported the campaign was no longer paying its South Carolina staff. Then, CBS News reportedthat none of Perry's campaign staff anywhere in the country is getting paid anymore. But Perry's campaign aides as well as leaders of an allied super PAC said they will continue raising money and that the former governor is committed to a strong performance in the early contests next year. 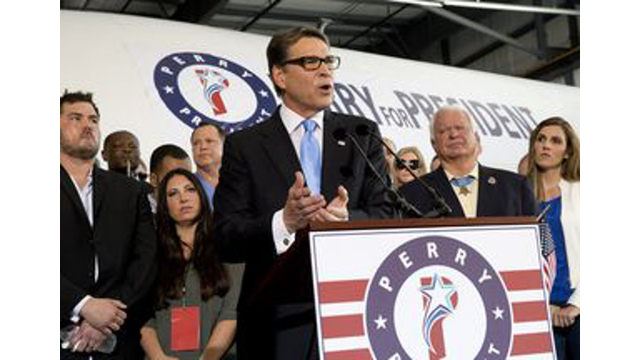 Perry is planning to campaign in South Carolina on Thursday and to visit Iowa next week. "As the campaign moves along, tough decisions have to be made in respect to both monetary and time related resources," Perry campaign manager Jeff Miller said. "Governor Perry remains committed to competing in the early states and will continue to have a strong presence in Iowa, New Hampshire and South Carolina."